Published: Oct. 14, 2018 at 03:08 p.m.
Atlanta Falcons safety Brian Poole intercepts Tampa Bay Buccaneers quarterback Jameis Winston in the red zone. Published: Aug. 25, 2018 at 07:41 p.m.
Jacksonville Jaguars wide receiver Marqise Lee fumbles a 20-yard pass from Jacksonville Jaguars quarterback Black Bortles after injury his leg. 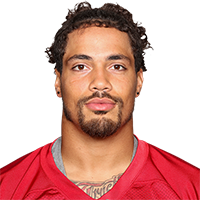 Published: Aug. 26, 2017 at 07:31 p.m.
Atlanta Falcons linebacker Duke Riley recovers a fumble by Arizona Cardinals running back Chris Johnson.